What the **** is for dinner? A busy family's quest to be better prepared to eat on a budget while thinking about the food that they put into their bodies. We havent been to Cabin 12 since long before it moved to the new location. Okay, we finally ordered. No apology; business as usual? I hope not because we are hungry. 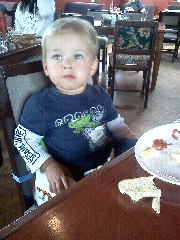 Interesting to note: we are 1 of 3 tables, currently only 5 tables seated in entire restaurant, dining with a baby. One thing that really bothers me while dining out is when I can hear the staff complaining. The waiter was complaining to another patron (?) about how busy they were. Well, there were maybe 2 tables finishing as we got there, 3 eating while we were, and 1 that came in after us. Maybe not even that . many total. In my opinion, it was dead. Why complain? He seemed unable to handle his workload still, and that made me nervous for him and the establishment, as if this is busy for them, yikes! The food was also not up to the standards of the downtown Cabin 12. The hasbrowns were absolutely AWFUL! Matt and I could not agree on the origins, but I thought they were bad enough that they were previously frozen and cooked until they were flakey and dry. 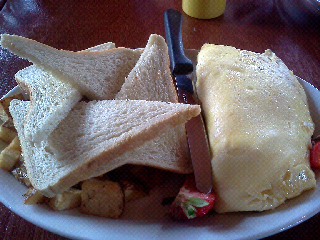 Matt ate an omelette with bacon, feta, and red peppers. That, he states, was delicious. 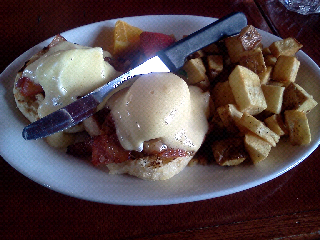 I had the Badger Benny. I can't remember exactly what was on it, but it had various meats and veggies (tried to look online, but for some reason they don't post the full menu??) like bacon, sausage, onion, and tomato. The eggs were well done, and the Hollandaise was good too. However, the hasbrowns were really unforgivable. Breakfast is what Cabin 12 does. And hasbrowns are 1/2 the meal. Really gross. Huge fail. But still, the service was lacking, and the atmosphere felt kind of off. Maybe they are being haunted by the ghosts of all the failed restaurants that have tried to open in this location?